The two most popular shutter materials used in the modern area are aluminum and timber shutters. Both have their own merits and both are a great choice for any homeowners. There are some cases where it will be wise to choose one over the other and we will definitely go over that in this article. After reading this article you will know the right questions and have many of the right questions to ask as you purchase your new best shutters. Timber shutters are the classic form of shutters that everyone is use to seeing. They are ageless and do a great job. The only drawbacks in some areas is that they might be attacked by insects and they can rot. This doesn't happen often but it is something that you should look into. They typically last a very long time and look great. The type of maintenance that they need will be a washing off and maybe after a few decades of use a paint job. They are a good choice and are typically very affordable. 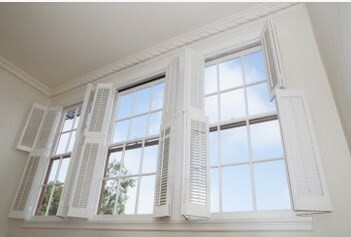 All shutter have there benefits and drawbacks but for the most part aluminum shutters have only an upside. If there is any drawback it might be price because they are a little bit more expensive than timber shutters. With aluminum shutters, they are insect proof, they won't rot and they will out live you. The only maintenance that they need might be painting after 20 years or so but that might not even be needed depending on where you live. In most areas they might just need to be washed off once a year. Which One Should You Decide? As you have read, it depends on your budget and on where you live. If your budget isn't high then you will likely only be able to get timber shutters which is perfectly fine and has served people well throughout the years. If you like in an area known for termite problems then it might not be the very best choice. The benefit of aluminum is that it will last forever, it will never rot, insects cannot infest it but the only minor drawback is that is can be a little more expensive than timber shutters.